RÖHR HP-160L Welding Machine. 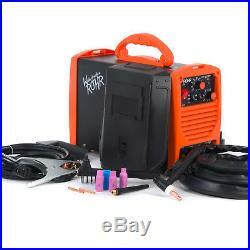 ROHR TIG Welder WSME-200. 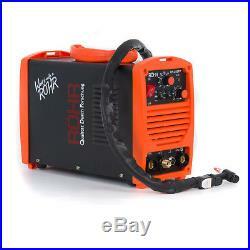 ROHR TIG Welder HP-200PP. ROHR MIG Welder MIG-135A. ROHR MIG Welder MIG-150R. ROHR MIG Welder MIG-200MI. 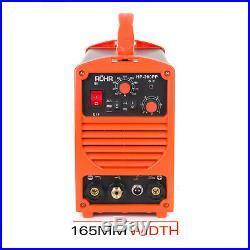 ROHR MIG Welder MMA-200FI. Weld it with a Röhr! When it comes to designing and manufacturing welders, Röhr have extensive, unparalleled knowledge. They combine breakthrough technologies to produce some of the most advanced and capable welding machines on the market, giving you the power to create, repair and fabricate a variety of metals with precision and ease. Röhr welders are easy to use and perfectly suited to experienced and new users alike. You can carry out a huge range of welding including vehicle’s, fabrication, house maintenance or more unconventional work where specialist materials require more advanced features. Whether it’s aluminium bike frames or a revived passion for steel sculpture, there’s a Röhr for the job and a Röhr for you! 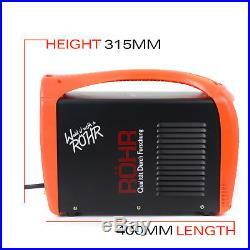 Mr Dillon’s review on his Röhr Welder. If I was to find a fault I would say The rod holder is a little finacky but perfectly functional. The RÖHR comes well equiped with 2m Stick Weld Clamp, 2m Earthing Clamp with a 1.5m Electric Cord to give you plenty of reach. 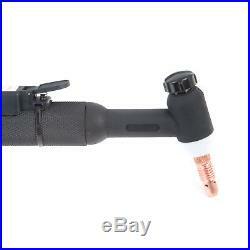 The TIG Weld Gun has a 4m (heatproof) Cord and supplied with the welder are 3 x Brass Collets. We even throw in a Welding Mask and wire brush to make sure you are ready to go out the box. 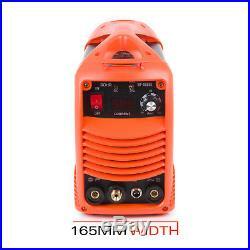 The HP-160L has a Dual Output – MMA / TIG function. It comes standard with HF (High Frequency Start) and Thermal Overload Protection with an Adjustable Output Current: 5-200A. All powered by a 3 Pin Standard UK 13 amp Plug and including a transportation strap to make sure you can carry, plug and play. Featuring ARC-Force, Hot Start and Anti-Stick with MOSFET technology all cooled with With powerful ventilators, the RÖHR is a welder that has it all. Using the latest Inverter technology to dramatically reduce overall footprint, this welder is compact whilst maintaining the features and control of some of its bigger brothers. RÖHR HP-160L TIG Welder. As well as size, Inverters dramatically reduce the power required to weld, increasing efficiency by 30%, whilst producing a constant power supply for a more stable welding arc. This TIG welding machine is easy for arc initiation and features: arc initiation current, arc stop current, welding current, basic value current, current ascending time, current descending time, gas delay time, continuous adjustment. What’s more, pulse frequency and pulse duty can also be adjusted independently. It has the characteristics of automatic control of arc initiation, arc stop and stable arc, which yield the best results for shape and inner quality of the welding surface. Its exclusive design is especially suitable for bicycle industry. The machine can be for multi-use, and can weld stainless steel, carbon steel, copper and other colour metal, and also can use for traditional electric welding. Its transfer efficiency is above 90%. Robust Design in a Compact Form. 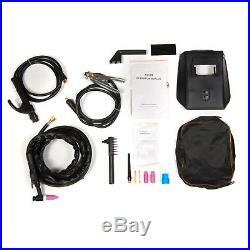 Portable & Storable with 1.5m Electric Cord + 13amp Plug. Stick Weld Attachment with 2m Cord. 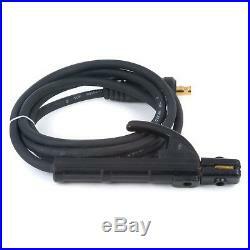 Earthing Clamp with 2m Cord. 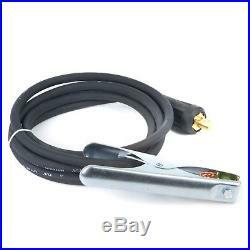 TIG Welding Gun with 4m (heatproof) Cord. Ceramic Cups & Collets. Free Welding Mask with Glass. Choosing the correct Welder. Röhr Welders offer everyday solutions for a variety of welding needs. Choosing is easy with our guides and product details. Different materials require a certain type of weld. Some of our machines will do it all whilst others specialise. Materials and thickness define the amount of power you require. As a rule of thumb, the higher the better. MIG (GMAW) – Metal Inert Gas. Uses an inert gas shroud around a continuously-fed reel filament to melt and join surfaces. Faster than TIG, suitable for most welding applications. TIG (GTAW) – Tungsten Inert Gas. Uses a tungsten filament rod with inert gas shroud to melt and join surfaces. Produces a strong and higher quality weld than MIG. MAG (GMAW) – Metal Active Gas. 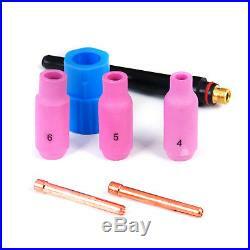 Reacts with the weld to produce less spatter or burn-in. Aluminium & Other Steels. MMA (ARC/SMAW) – Manual Metal Arc. Traditional welding technique using a flux core. Simple vs alternatives, quick to learn. Can be used for Aluminium, Copper etc. IGBT – Insulated Gate Bi-polar Transistor. Most recent technology using capacitors. Stores high voltages for steady release. Inverter – Alters Input Power for Desired Use. Rectifies AC to DC. Choosing the correct welding machine can be a daunting process. The task in hand should define the product you require but also consider additional uses which you may encounter in the future. More capable machines offer greater flexibility with materials and offer more control whilst a more basic welder will produce the desired results for a known task. Please note the welding machines are not supplied with consumable components such as wire or gas. Power Voltage (V): Single Phase AC 230V±15%. Input Current (A): 24. Output Current (A): 20-160. Duty Cycle (%): 60. No-Load Voltage (V): 56. Power Factor: 0.73. Housing Protection Grade: IP21. 1 x Welder Unit. 4 x Stick-Weld Armature. 1 x TIG-Weld Armature. 2 x Earthing Clamp. 1 x Welding Mask & Glass. 1 x Cleaning Brush. 3 x Brass Collets. 1 x Blue Collar. 1 x Black Gun Cap. 1 x Accessory Bag. 1 x User Manual. Weight: GW 9KG (19.8lb). Overall Dimensions (LxWxH): 400mm x 165mm x 315mm (15.7″ x 6.5″ x 12.4). 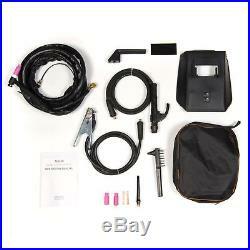 Our Comprehensive Range of Official Spares and Accessories. Böhler AG-3000K Petrol Generator. Why Shop with us? The item “TIG ARC Welder Inverter MOSFET MMA 240V / 160 amp, DC Portable Machine ROHR 01″ is in sale since Monday, January 15, 2018. This item is in the category “Business, Office & Industrial\Metalworking/Milling/Welding\Welding & Soldering\Welding\Welders, Cutters & Torches\TIG Welders”. The seller is “union-mart-uk” and is located in Eastleigh. This item can be shipped worldwide. RÖHR HP-200PP Welding Machine. 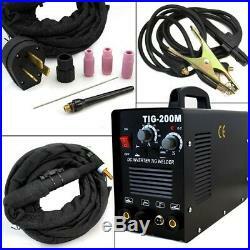 ROHR TIG Welder WSME-200. 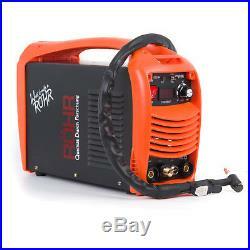 ROHR TIG Welder HP-200PP. ROHR MIG Welder MIG-135A. ROHR MIG Welder MIG-150R. 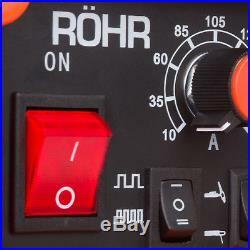 ROHR MIG Welder MIG-200MI. 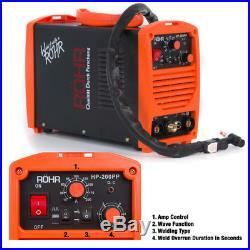 ROHR MIG Welder MMA-200FI. Weld it with a Röhr! By combining breakthrough technologies Röhr have produced some of the most advanced and capable welding machines on the market with features more commonly associated with expensive industrial equipment. Simple from start to finish – with familiar terms and set-up for the experienced, and logical layout with full instructions for new users, the Röhr range gives you the power to create, repair and fabricate a variety of metals with precision and ease. All Röhr welding machines are suitable for domestic uses such as vehicle repair, house maintenance and fabrications; they are equally well equipped for more unconventional work where specialist materials require more advanced features. Whether it’s aluminium bike frames or a revived passion for steel sculpture there’s a Röhr for the job and a Röhr for you! HF (High Frequency Start). ARC-Force, Hot Start and Anti-Stick. Dual Output – MMA / TIG. 2m Stick Weld Clamp. 1.5m Electric Cord. 4m (heatproof) TIG Weld Gun Cord. 3 x Tungsten Tips 2.0mm, 2.4mm, 3.2mm. Adjustable Output Current: 5-200A. 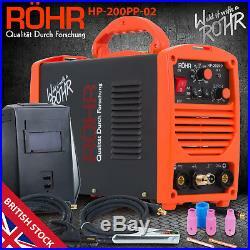 RÖHR HP-200PP TIG Welder. Using the latest Inverter technology to dramatically reduce overall footprint, this welder is compact whilst maintaining the features and control of some of its bigger brothers. As well as size, Inverters dramatically reduce the power required to weld, increasing efficiency by 30%, whilst producing a constant power supply for a more stable welding arc. This TIG welding machine is easy for arc initiation and features: arc initiation current, arc stop current, welding current, basic value current, current ascending time, current descending time, gas delay time, continuous adjustment. Whats more, pulse frequency and pulse duty can also be adjusted independently. It has the characteristics of automatic control of arc initiation, arc stop and stable arc, which yield the best results for shape and inner quality of the welding surface. Its exclusive design is especially suitable for bicycle industry. The machine can be for multi-use, and can weld stainless steel, carbon steel, copper and other color metal, and also can use for traditional electric welding. Its transfer efficiency is above 85%. Well Equipped Out The Box. Robust Frame with Large Handle. Compact for Storage and Portability. A Variety of Cups and Collets Included. Free Welding Mask with Glass. Detailed Controls with Big Visuals. Choosing the correct Welder. Röhr Welders offer everyday solutions for a variety of welding needs. Choosing is easy with our guides and product details. Different materials require a certain type of weld. Some of our machines will do it all whilst others specialise. Materials and thickness define the amount of power you require. As a rule of thumb, the higher the better. MIG (GMAW) – Metal Inert Gas. Uses an inert gas shroud around a continuously-fed reel filament to melt and join surfaces. Faster than TIG, suitable for most welding applications. TIG (GTAW) – Tungsten Inert Gas. Uses a tungsten filament rod with inert gas shroud to melt and join surfaces. Produces a strong and higher quality weld than MIG. MAG (GMAW) – Metal Active Gas. Reacts with the weld to produce less spatter or burn-in. Aluminium & Other Steels. MMA (ARC/SMAW) – Manual Metal Arc. Traditional welding technique using a flux core. Simple vs alternatives, quick to learn. Can be used for Aluminium, Copper etc. IGBT – Insulated Gate Bi-polar Transistor. Most recent technology using capacitors. Stores high voltages for steady release. Inverter – Alters Input Power for Desired Use. Rectifies AC to DC. Choosing the correct welding machine can be a daunting process. The task in hand should define the product you require but also consider additional uses which you may encounter in the future. More capable machines offer greater flexibility with materials and offer more control whilst a more basic welder will produce the desired results for a known task. Please note the welding machines are not supplied with consumable components such as wire or gas. Power Voltage (V): Single Phase AC 230V±15%. Input Current (A): 32. Output Current (A): 20-200. Duty Cycle (%): 60. No-Load Voltage (V): 56. Power Factor: 0.73. Housing Protection Grade: IP21. 1 x Welder Unit. 4 x Stick-Weld Armature. 1 x TIG-Weld Armature. 2 x Earthing Clamp. 1 x Welding Mask & Glass. 1 x Cleaning Brush. 1 x 3x Ceramic Cups, 2x Brass Collets, 1x Blue Collar. 3 x Tungsten Tips. 1 x Accessory Bag. 1 x User Manual. Weight: GW 9KG (19.8lb). Overall Dimensions (LxWxH): 400mm x 165mm x 315mm (15.7″ x 6.5″ x 12.4). Our On-Site Comprehensive Range of Official Spares and Accessories. Why Shop with us? 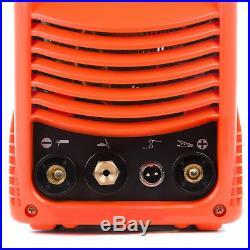 The item “TIG ARC Welder Inverter MOSFET MMA 240V / 200 amp, DC Portable Machine ROHR 02″ is in sale since Monday, January 15, 2018. This item is in the category “Business, Office & Industrial\Metalworking/Milling/Welding\Welding & Soldering\Welding\Welders, Cutters & Torches\TIG Welders”. The seller is “union-mart-uk” and is located in Eastleigh. This item can be shipped worldwide. Röhr TIG Welder WSME-200. 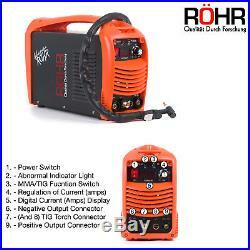 Röhr TIG Welder HP-200PP. Röhr MIG Welder MIG-135A. Röhr MIG Welder MIG-150R. 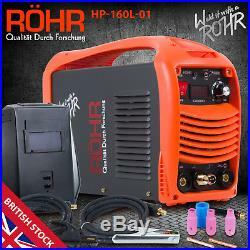 Röhr MIG Welder HP-160L. Röhr MIG Welder MMA-250FI. WELD IT WITH A RÖHR! When it comes to designing and manufacturing welders, Röhr have extensive, unparalleled knowledge. They combine breakthrough technologies to produce some of the most advanced and capable welding machines on the market, giving you the power to create, repair and fabricate a variety of metals with precision and ease. Röhr welders are easy to use and perfectly suited to experienced and new users alike. You can carry out a huge range of welding including vehicle’s, fabrication, house maintenance or more unconventional work where specialist materials require more advanced features. Whether it’s aluminium bike frames or a revived passion for steel sculpture, there’s a Röhr for the job and a Röhr for you! Mr Dillon’s review on his Röhr Welder. If I was to find a fault I would say The rod holder is a little finacky but perfectly functional. 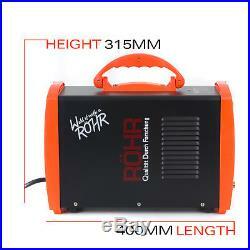 RÖHR HP-250PP TIG WELDER. Unlike many sellers, we have a fully trained service department and carry a comprehensive range of spares. Using the latest Inverter technology to dramatically reduce overall footprint, this welder is compact whilst maintaining the features and control of some of its bigger brothers. As well as size, Inverters dramatically reduce the power required to weld, increasing efficiency by 30%, whilst producing a constant power supply for a more stable welding arc. This TIG welding machine is easy for arc initiation and features: arc initiation current, arc stop current, welding current, basic value current, current ascending time, current descending time, gas delay time, continuous adjustment. Whats more, pulse frequency and pulse duty can also be adjusted independently. It has the characteristics of automatic control of arc initiation, arc stop and stable arc, which yeild the best results for shape and inner quality of the welding surface. Its exclusive design is especially suitable for bicycle industry. The machine can be for multi-use, and can weld stainless steel, carbon steel, copper and other color metal, and also can use for traditional electric welding. Its transfer efficiency is above 85%. For TIG DC and MMA welding processes. Many special functions such as ARC-Force, Hot Start and Anti-Stick. Well Equipped Out The Box. Robust Frame with Large Handle. Compact for Storage & Portability. Cups & Collets Included. Detailed Controls & Big Visuals. Choosing the correct Welder: Röhr Welders offer everyday solutions for a variety of welding needs. Choosing is easy with our guides and product details. Material: Different materials require a certain type of weld. Some of our machines will do it all whilst others specialise Amp Output: Materials and thickness define the amount of power you require. As a rule of thumb, the higher the better. MIG (GMAW) – METAL INERT GAS. Uses an inert gas shroud around a continuously-fed reel filament to melt and join surfaces. Faster than TIG, suitable for most welding applications. Suitable For: Aluminium Steel/Stainless Most Uses. TIG (GTAW) – TUNGSTEN INERT GAS. Uses a tungsten filament rod with inert gas shroud to melt and join surfaces. Produces a strong and higher quality weld than MIG. Suitable For: Stainless Steel Thinner Metals Fine Joinery. MAG (GMAW) – METAL ACTIVE GAS. Reacts with the weld to produce less spatter or burn-in. Suitable For: Steels (non-Alloy) High Strength Joins Aluminium & Other Steels. MMA (ARC/SMAW) – MANUAL METAL ARC. Traditional welding technique using a flux core. Simple vs alternatives, quick to learn. Suitable For: Steels (non-Alloy) Iron Can be used for Aluminium, Copper etc. IGBT – INSULATED GATE BI-POLAR TRANSISTOR. Most recent technology using capacitors. Stores high voltages for steady release. 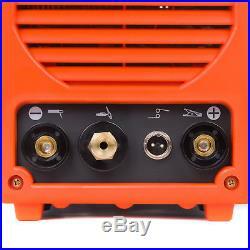 Advantages: Multi Purpose TIG/MIG Micro Controlled Current Highly Efficient. INVERTER – ALTERS INPUT POWER FOR USE. Rectifies AC to DC. 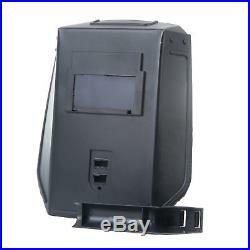 Advantages: Controllable Output 0-100% Lower Power Consumption Highly Portable. Choosing the correct welding machine can be a daunting process. The task in hand should define the product you require but also consider additional uses which you may encounter in the future. More capable machines offer greater flexibility with materials and offer more control whilst a more basic welder will produce the desired results for a known task. Please note the welding machines are not supplied with consumable components such as wire or gas. Power Voltage (V): Single Phase AC 230V±15%. Input Current (A): 34. Output Current (A): 20-250. Duty Cycle (%): 60. No-Load Voltage (V): 56. Rated Working Voltage (V): 20. Housing Protection Grade: IP21. Power Factor: 0.73. 1 x Welder Unit. 4 x Stick-Weld Armature. 1 x TIG-Weld Armature. 1 x Earthing Clamp. 1 x Welding Mask & Glass. 1 x Cleaning Brush. 1 x 3x Ceramic Cups, 2x Brass Collets, 1x Blue Collar. 1 x Black Gun Cap. 1 x Accessory Bag. 1 x User Manual. Dimensions (Boxed) L x W x H: 400mm x 165mm x 315mm (15.7″ x 6.5″ x 12.4). Gross Weight: 9KG (19.8lb). Our Comprehensive Range of Official Spares and Accessories. Böhler AG-3000K Petrol Generator. Why Shop with us? The item “TIG ARC Welder Inverter MOSFET MMA 240V / 250 amp / DC Portable Machine ROHR” is in sale since Wednesday, July 25, 2018. This item is in the category “Business, Office & Industrial\Metalworking/Milling/Welding\Welding & Soldering\Welding\Welders, Cutters & Torches\TIG Welders”. The seller is “union-mart-uk” and is located in Southampton. This item can be shipped worldwide.